1. Cook bulghur wheat, couscous, or quinoa according to instructions on packet. I always add a bit of olive oil and salt to the water while cooking. 2. Finely chop the parsley, mint, cucumber, tomato, red onion, garlic and mix in a large bowl. 3. Add juice from lemons, olive oil, salt, and pepper to taste. 4. 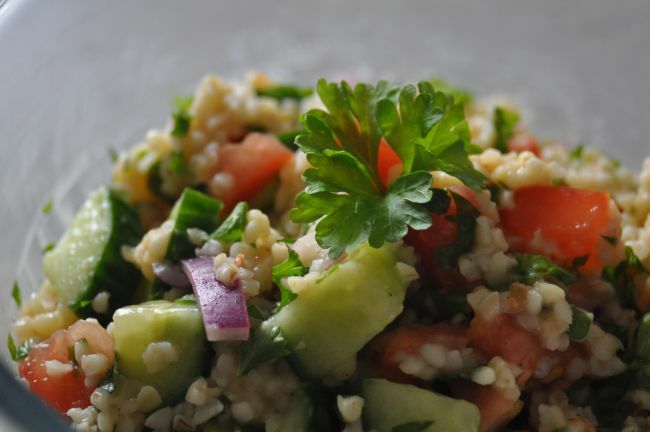 Once the bulghur wheat, couscous, or quinoa is cooked, add to the mixing bowl and incorporate.